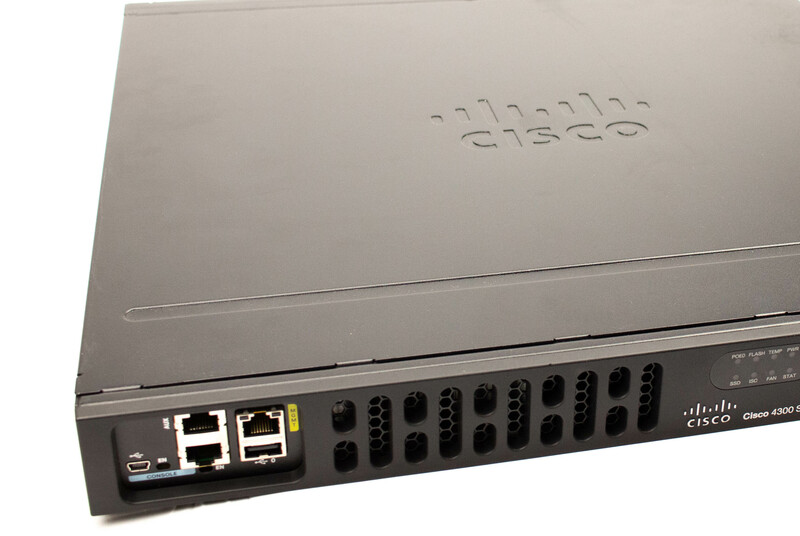 The Cisco ISR 4000 Series revolutionizes WAN communications within enterprise branches. With new levels of built-in intelligent network capabilities and convergence. The Cisco ISR 4000 is specifically designed for enterprise companies with the growing need for application-aware networking. These companies tend to lean on IT resources. But they often have a growing need for direct communication with both private data centers and public clouds across diverse links. Including Multiprotocol Label Switching (MPLS) VPNs and the Internet. The service plane is separate from the data and control planes. The Cisco ISR 4000 series routers can handle heavier services on a single platform, allowing the enterprise world to gain the best possible outcomes. Solutions such as Cisco Unified Border Element (CUBE), Cisco Unified Survivable Remote Site Telephony (SRST), or various routing services can be deployed more easily and efficiently on a single ISR. In addition, for many of the services, such as CUBE, the scalability is significantly greater without added costs per-port. The performance remains solid across the majority of a typical branch-office. Providing an application-specific integrated circuit (ASIC)-like performance in a highly reliable platform. The Cisco 4000 Series is designed to help branch and remote offices, do more with less. These routers provide higher bandwidth for heavy service combinations with greatly enhanced WAN management. In addition, the 4000 series introduces embedded X86-based virtual machines. With options for data center-class servers and unprecedented flexibility for upgrading. Cisco 4000 Series ISRs provide you with Cisco Intelligent WAN (IWAN) software and a converged branch infrastructure. Along with superior throughput, these capabilities form the building blocks of next-generation, branch-office WAN solutions. Cisco IWAN is a set of intelligent software services, that allow you to reliably and securely connect users, devices, and branch office locations across a diverse set of WAN transport links. IWAN-enabled routers, like the 4000 Series, dynamically route traffic across the “best” link. Based upon an up-to-the-minute application and network conditions for great application experiences. You receive control over application performance, bandwidth usage, data privacy, and availability of your WAN links. Control that you need as your branches conduct greater volumes of mission-critical business. The Cisco 4000 Series ISRs consolidate many must-have functions. Including network, computer, and storage resources. The high-performance integrated routers run multiple concurrent IWAN services. Including encryption, traffic management, and WAN optimization. All of this is done without slowing your data throughput. You can also activate new services on demand through a simple licensing change. The 4000 Series ISR provides branch offices with less need for rack space and lower cost for maintenance, power, and cooling. 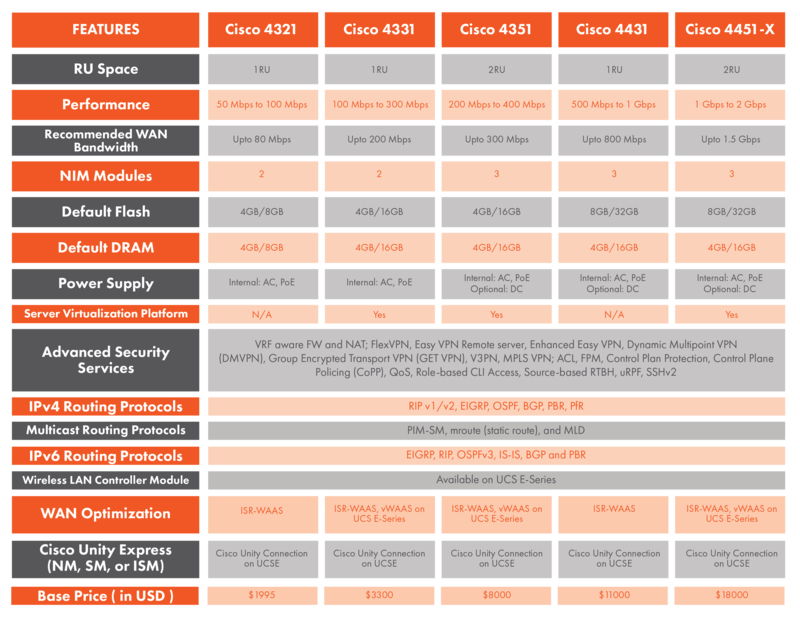 Check out the comparison of ISR 4000 Models. 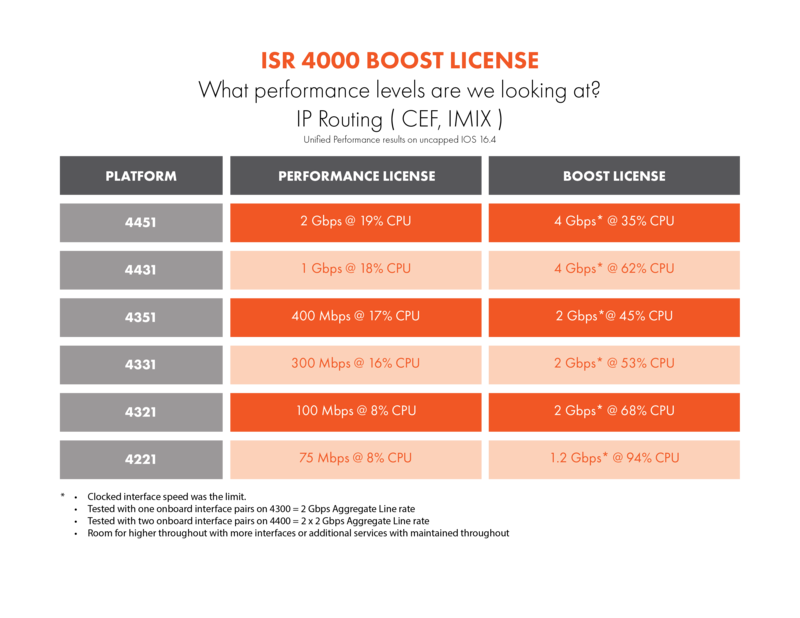 A licensing model based on a single technology and Smart Licensing has been designed for Cisco ISR 4000. Which is intended to provide enterprise-level agreements for all Cisco ISR and other Cisco products. Smart Licensing provides a software inventory management system that provides customers with Cisco and selected partners with information about Software Ownership and Software Utilization. As a client of Smart Licensing, you receive features such as a standardized licensing platform for Cisco ISR. This simplifies the Cisco software experience and helps you to understand how to Cisco ISR 4000 software is used in your network for better deployment. Smart Licensing is the next enervation licensing platform for all Cisco ISR 4000 software products. Ensure that Call Home is enabled before using the Smart Licensing Client feature. Cisco 4000 Series and ISR platforms support Cisco One Suites License Technology, Package License, Throughput License, and HSECK9 license in Cisco Smart Licensing. Be the first to know about new product resources from PivIT Global!